"Makes No Difference" - Red Carpet Premiere! Smash Hit or Box Office Crash!! "Sk8er Boi" - Hey Taxi! To the Hospital, and Hurry!! "I Was Born to Love You" - Art and Beauty! Love and Happiness!? "Rock This Town" - Magic Meets Madness! The Show Must Go On! "Highway Star" - A Pug's Life! 400 Milles from Home!! "Y.M.C.A." - Ahoy, Mates! Sunken Delights and Adcenture!! "Canned Heat" - Family Honor! Introducing the Secret-Weapon Ninja!! "La La" - NURSE! Gold Metal Hero or Zero!! "Let's Dance" - Rags to Riches! Go East Wildcatter! "The Anthem" - Batter Up! Home Run Here Makes Comeback!! "ABC" - Here, Kitty, Kitty! Baby Hijinks!! 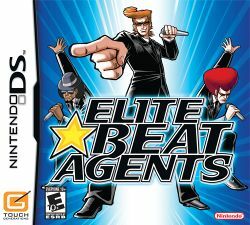 Elite Beat Agents is a rhythm game developed by iNiS for the Nintendo DS. It is an English adaptation to Osu! Tatakae! Ouendan, a Japanese rhythm game released in 2005. The game was released on November 6, 2006 in North America. Elite Beat Agents was released under Nintendo's Touch! Generations label. The game takes place on a miniature version of Earth where a secret agent style organization called "EBA" receives cries of help from the populous. The chief responds with "Agents are... GO!" at the start of every mission. The agents arrive just in time to dance to a song and cheer the people in distress to victory. Using the DS stylus and the touch screen, players tap, slide, and circle their way stylus across the screen, all while cheering the people in distress to victory. This page was last edited on 30 June 2008, at 03:45.